Rabbit Hutch Set Outback Comfort + Pen. The hutch is divided into a house for sleeping and the pen or run. Clasps ensure that the hutch house and pen are completely connected. The wooden front door of the sleeping room can be comfortably opened for cleaning and serves as a ramp to reach the stall from the run. The hutch itself has a grated door. The sleeping chamber comes with a coated wood floor while the rest of the hutch has a finely meshed removable floor. Due to the special treatment of the wood and the unique tar-paper roof construction the hutch is weatherproof. The four feet on the bottom are covered with plastic to protect the hutch from ground moisture. The Rabbit Run is made with a stable grated wood construction that can be easily folded up to save space. It is complete with a mesh roof that protects your rabbit from predators and keeps your rabbit from escaping. 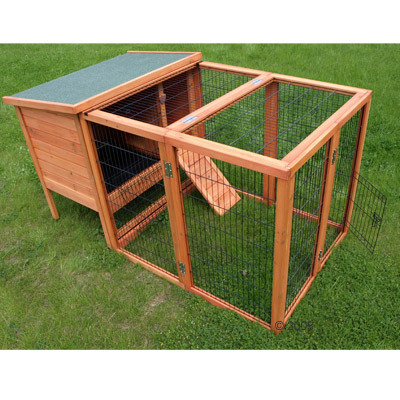 The run comes with two doors - one on the side and on in the front so that your rabbits can easily be moved in and out of the run.